The map to soulful love is locked within the secret chambers of your heart—here is the key. “Filling up and spilling over, it’s an endless waterfall,” are lyrics by Chris Williamson, one of our favorite singers. We know that love is endless and abundant and we want to spread the good news! A drink of love has the power of healing, connecting and awakening our spiritual nature. We want to widely share the immense joy we have experienced and the vital secrets we have uncovered throughout our marriage. Having worked with thousands of couples as marriage counselors, program presenters, retreat facilitators and coaches for soulful couples, we have a wealth of practical suggestions and helpful practices to share with committed couples seeking to expand their love. We realize that a vague and perhaps unfulfilled promise of love in a marriage can create so much pain and confusion for many people. We hope that readers benefit from and appreciate the lessons inherent in our personal accounts and stories, and those written by diverse couples who are developing sacred marriages. As shifts in consciousness about marriage are emerging, we feel compelled to narrate and illuminate the evolving changes. This book is primarily intended for couples of all ages and orientations who are dedicated to self-development and to enhancing their primary relationship in many areas. Our book is also written to serve those in the process of grieving the loss of a significant relationship and to offer inspiration and direction for people seeking a future strong, loving relationship. Those who embrace spirituality and vision building in their marriages are especially likely to gain value from this book. 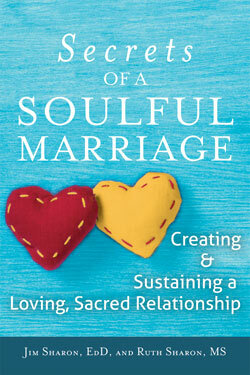 What are the essential qualities of a soulful marriage? Foundationally, self-acceptance and self-love set the stage for authentically loving your partner and humbly being loved. Sufficiently completing your past patterns and healing your wounds open the way to healthy marital interaction. Being deeply committed and loyal to your beloved, taking responsibility for your own needs and feelings and supporting each other’s overall well-being and life purpose(s) create and sustain soulful marriage. Important aspects of spiritual development include treating each other with respect, actively building trust, communicating effectively and gaining skills and attitudes for resolving conflicts. Sharing spiritual practices and perspectives elevates love and expands soulful connections. How do you assess whether your relationship is a soulful one? The term “soulful marriage” is highly subjective. Its meaning varies considerably from one couple to another, depending on factors such as personal background, values, personality types, needs and interests. That said, this book identifies various key ingredients that most couples endorse as important contributors to the vitality, strength and sanctity of their marriages. Able to manage household and financial responsibilities cooperatively? Having a satisfying sexual and intimate connection? Honoring and respecting each other with heartfelt love? Open, honest and proactive in developing yourself and your relationship? Cherishing, admiring and affirming your partner and your relationship? Attuned to your personal and collective soulful, spiritual nature? What support and understanding do you need/want from the others in your group so that the book club is a worthwhile experience? What agreements can you establish so you can feel safe to grow as your own evolving soulful self and as a couple? Are you willing to take responsibility for your personal needs getting met? Will you encourage others to be assertive about their needs too? Keep a record of your agreements and guidelines. Decide on the format, meeting times and places and duration of your book study, as well as leaders and support roles. Will you include food? Alcohol? Babysitting support? Will you bring in outside speakers or facilitators to enhance the experience? Seek guidance and support from the authors of Secrets of a Soulful Marriage, Jim and Ruth Sharon, through www.energyforlife.us. As you read over the Table of Contents, what chapter first calls your attention? What draws you to that chapter? What emotional reactions (positive or negative) are you aware of when you read the Introduction and prepare to delve into this evocative book? Share your personal story of meeting your partner. What are you placing in your “backpack” to take on the journey of a soulful relationship? How has your personal history influenced your current or most recent love relationship? What condition is your “I am lovable and capable” sign in right now? What do you need in order to repair rips and tears from your past? How might you polish and shine your sign? What has helped you to overcome your need to be perfect? What tips can you offer about accepting yourself? About embracing your partner? Discuss what the term “shifts in consciousness” means to you. Keep a journal or record of your changes throughout this book study. Be creative in how you express your journey (art, poetry, prose, etc). What are some negative attitudes or behavior patterns from your past that you have discontinued? How are you now more authentic in your life and in your relationship? What are some ways that you and your partner encourage each other’s independence or autonomy? What are some examples of how each of you supports the other to express his or her individuality? What is the next step you would like to take, or know you need to take, toward forgiving yourself or your mate? List a few instances in which you managed or overcame fear and in the process improved your relationship. Discuss your challenges in speaking clearly, assertively and powerfully, especially when angry or stressed. Share several examples of you and your beloved communicating successfully and masterfully. What are you learning about listening in a “dance” with your partner’s speaking? How can you use the “cup” and “sword” to de-escalate the power struggles you and your partner engage in? What communication tools, including fair fighting, do you practice to connect effectively with your lover? What supportive tips can you offer to the group? What communication skills do you want to practice or hone through your group participation? Describe some of your thoughts and feelings of cherishing your beloved. How have your feelings deepened or intensified over time? What are some ways you demonstrate respect for your mate? How have you been more respectful over time? How would you want to honor your spouse more? What concrete changes can you imagine resulting from being more adoring and respectful? List some ways in which you and your partner honor differences between you. What are some of your favorite ways that you two reignite the fire of passion and bask in the warmth of intimacy? What risks are you willing to take to share more of your authentic self? How effective are you at expressing your dreams and goals? Your true feelings and needs? Vulnerable aspects of yourself? Growing takes courage and commitment to evolve into more of yourself. What does being curious, living in the mystery and exploring positive possibilities mean to you? What types of in-house dates bring you closer? What out-of-the-house dates do you want to plan for the near future? How would you introduce more surprise into your soulful relationship? Identify two or three areas of your personal life that are flowing rather smoothly, such as your job, exercise, recreation or spirituality. Conversely, what are a few areas you need to further develop? What facets of your relationship with your partner are in harmony, such as common interests, romance, household management and parenting? Which ones are “out of sync” or require greater collaboration? What are the main challenges you encounter in leading a balanced life? connection in your relationship? Explain your response. Tell the group about your children or your intention for having children. Describe your parenting style and challenges. What “shifts in consciousness” are you aware of regarding how you were raised and how you raise your children? What are some of your secrets for staying connected while parenting? How would you describe couple care? Who is in your village (supportive community)? How do they help you to raise your family in healthy ways? What role models do your kids emulate? What support do they offer you? How do you develop a spiritual home for you and your family? What works and what doesn’t work in your efforts to evolve as a soulful family? Extend your wishes and dreams further than usual in picturing a glorious future for your relationship. What would be some initial steps that you and your beloved could take toward realizing at least some of that splendid future? If you were to draft a mission statement that represented your relationship ideals, what key items would you want to include? What “keys” are you willing to use to clearly enliven and enhance your relationship? How can you more actively support your partner to fulfill her or his life purpose? What does the opening quote about living as a spiritual being having a human experience mean to you? What wisdom can you share with the others in your group that may light their path? What do you sense about your partner being a catalyst to your spiritual awakening? Describe how you have matured emotionally and have become more available to love and be loved in your relationship. What do you think, feel or sense about love being a holy crucible? In what ways do you consciously energize your soul purpose by being together? Share your vision of the promise of love being fulfilled in your soulful marriage. Feel free to add other questions for your group and send feedback to info@energyforlife.us. Affirm yourself and those in your group for taking the journey as a soulful person in soulful relationship.